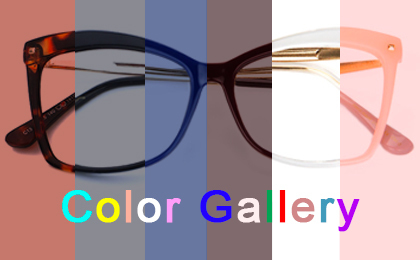 Voogueme aims to provide you a perfect pair of eyeglasses at the best price. If you have any problems, please feel free to contact us. Our customer service will offer you a reasonable solution for all kinds of problems about the glasses in 30 days from the date you receive the glasses. ▪ Subjective reason: There might be some visual differences due to different lights in sunlight and screen. Goods shall be in kind prevail. If you feel that the glasses do not meet your expectations, please contact our customer service within 30 days after receiving the glasses. You can buy a new pair of glasses with a special coupon or apply for a refund (excluding freight and lens costs). ▪ Prescription problem: If the glasses are not clear, please check your prescription first. If the prescription is correct, you could send it back to us for inspection within the 30-day warranty period and we will give you a replacement or refund if it is our responsibility; if you unfortunately fill in the wrong prescription, you can get a special coupon for your new glasses or you can get a refund(excluding freight and lens costs). Additional prescription: Before the order is processed, you can contact customer service to change the prescription of the glasses. After that, you cannot change it. If you want a pair of prescription glasses after receiving the frame, you only need to pay for the lenses to get a whole pair of glasses. ▪ Size problem: There will be a deviation of about 1-2mm in frame parameters due to different measurement techniques and angles, the actual parameters to prevail in kind. However, if the glasses are not suitable because you read the wrong size information accidentally, you should contact us to solve the problem within 30 days of receiving the glasses. Our customer service will give you a reasonable solution to exchange them or a discount code for new glasses. ▪ Receive wrong glasses: If you get wrong glasses that are not as you ordered, you need to provide a photo of the wrong glasses, then we will resend you a new pair of glasses for free after verification and you can keep the wrong glasses received. ▪ The lost glasses: In the following cases, we reissue the original order unconditionally: the customer provided a clear proof of loss; the post office showed proper delivery, and the customer contacted the local post several times without results; there was delivery time and waybill number but no logistics information. ▪ Transport damage: If the glasses are damaged due to the transport, we will replace the glasses for free or give you a partial refund. ▪ Damaged within 30 days: Free re-delivery is available within 30 days after the arrival of the cargo in case there is undesigned damage. This warranty does not cover normal wear and tear to the frames, lenses, or coatings. Damaged within 3 months: If it is damaged by non-human factors and cannot be used normally within 3 months(excluding normal wear and tear), please contact our customer service center to help you solve this problem. If it is more than 3 months, we will give you the best discount for your next purchase. Contact us via e-mail at support@voogueme.com within 30 days of receiving your eyeglasses. All returns must be returned in their unworn, original condition. Package your glasses securely and leave a note including your name, order number and a brief note describing the returning reason; or a copy of the prescription as well as PD that you received from your doctor, so that Voogueme can inspect the glasses. Voogueme would feel sorry if your glasses were lost during the shipment. Therefore, shipping your returns by a traceable method is recommended. Please send us the tracking number when you send the glasses to us. Once Voogueme gets the returned items, you will be refunded in 3 working days. Notes: We will not take the return postage(excluding our responsibility) and you need to bear it by yourself.